The Secure Gateway Service provides a quick, easy, and secure solution for connecting resources in a protected environment to cloud resources. By deploying the light-weight and natively installed Secure Gateway Client, you can establish a secure, persistent connection between your environment and the cloud through an outbound call. 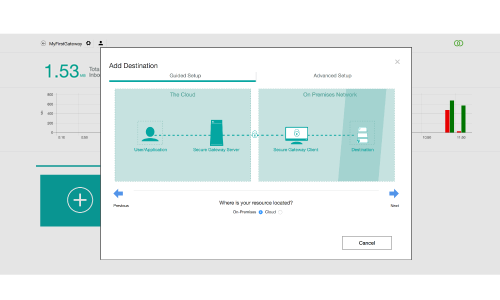 Once the client is connected, you can safely connect your applications and resources by specifying their host and port to create corresponding destinations on the cloud. Rather than bridging your environments at the network level like a traditional VPN that begins with full access and must be limited from the top down, Secure Gateway provides granular access only to the resources that you have defined. Quickly set up Gateways to connect your environments, manage the mapping between your local and remote destinations, and monitor all of your traffic. Simple access management controls are available from the Secure Gateway Client to allow or deny access on a per resource basis to prevent any unauthorized access. This list will automatically synchronize to any Client connected to the same Gateway. All communication with Secure Gateway is easily configurable to provide TLS encryption and mutual authentication. 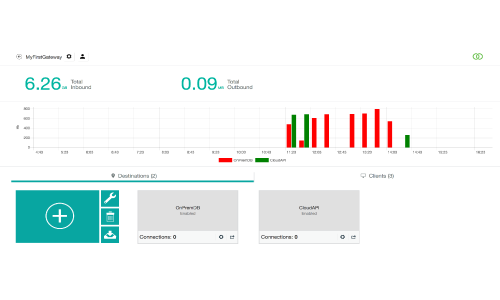 On Professional and Enterprise plans, you can connect multiple instances of the Secure Gateway Client to your gateway to automatically leverage built-in connection load balancing and connection fail-over should one Client instance go down. 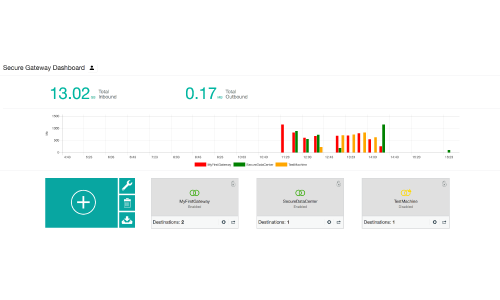 Monitor all your gateways from the Secure Gateway Dashboard or monitor individual gateways from the Secure Gateway Client.